"Oh, Morris. I have been a bad boy again." Serial murderers in life are really the rarest of commodities, but not so in the movies. The Ted Bundys of this world are deeply terrifying, but to film fans, the killer on a rampage is nearly a dime a dozen, especially these days�to make one truly compelling, a film generally needs a fresh take on the material, be it the sinuous intimacy of Hannibal Lecter, say, or the demonic cataloging of the killer in Se7en. 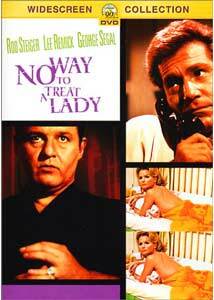 No Way to Treat a Lady has its angle: the serial murderer reinvents himself for each of his victims, making him unrecognizable as he sports new costumes, hair colors and accents. It's a theatrical conceit, obviously, more than anything an actor's idea of what a serial murderer should be; isn't especially convincing, but it does give a chance for Rod Steiger to tear it up. He's an actor eclipsed in his generation by others like Marlon Brando and Paul Newman, but I'd argue that he's as good as any of them; unquestionably, though, and especially here, there can be a hammy theatricality to his work. But how could there not be, as he plays a twinkly-eyed Irish priest in one scene, a German plumber in another, and a queeny hairdresser in the next? It's a performance not unlike Alec Guinness' in Kind Hearts and Coronets, or Peter Sellers' in Dr. Strangelove, almost as much a stunt as it is a good piece of acting. Lots of this is stereotypical, perhaps because so many serial-killer movies followed this one—there's a certain amount of cat and mouse between Brummell and Gill, but it's not especially scary, in some measure because Brummell doesn't seem like an especially gifted cop. (In the Line of Fire treads some of the same territory, with greater success.) He does meet a girl, of course: the hopelessly goyish Lee Remick, with a face to make Morris melt and to break his poor mama's heart. Their courtship gets a good amount of screen time, and it's not too hard to figure where it's going, but the tone is rather askew—every time Mo takes out his girl, it's like we've been dropped into a different movie. The movie is based on a novel by William Goldman, who is one of the greatest of all screenwriters—his scripts include Butch Cassidy And The Sundance Kid and All the President's Men, and it suggests to me that he knew something about the material that others didn't, since he didn't adapt the screenplay himself. (That's something he did for another of his novels, The Princess Bride.) Lots of the business of the movie has become the clichéd stuff of television cop shows: "Sorry to disturb you, but I'd like to ask you some questions." It's not necessarily bad, but the story in many respects feels short on invention. The movie is notable for a couple of incidental things: it was shot as New York City's Lincoln Center was under construction, and features, in smaller roles, David Doyle, better known as Bosley from Charlie's Angels, and a young Doris Roberts, now featured on Everybody Loves Raymond. Image Transfer Review: Colors are badly faded, and there's no shortage of scratches on the print. Transfer is acceptable, with care taken in the anamorphic image, but there are limits�in one scene, for instance, Remick wears a mod pink dress that maxes out the image quality, and may make you want to put on a pair of sunglasses. Audio Transfer Review: Again, problems with the source material�Remick and Segal are on a boat in one scene, and when the film cuts from one to the other, the ambient level changes so drastically that you'd think they were on different boats. Otherwise, dialogue is generally clear, though there's a good bit of hissing. Much is lost in Steiger's performance, as you might imagine, on the French-language track. Quelle dommage. Extras Review: English subtitles and chapter stops are the only extras. Steiger's strong, funny performance is the best thing about this movie, but the story isn't especially compelling or fraught with tension. Lee Remick sure was a dish, though.